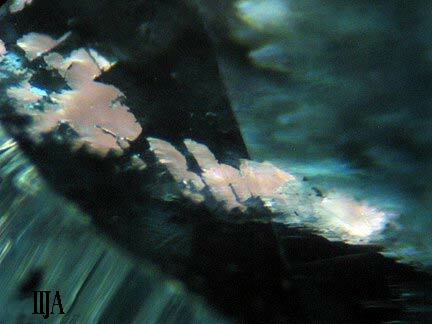 Editor’s Note: In light of the exposure of the perpetrators of the Tibet andesine fiasco, I have been asked to post a review of the color inhancement of tourmaline, particularly in light of the hijacking of the name “Paraiba” by the members of the Lab Manual Harmonization Committee for tourmalines not from Paraiba Brazil. Over the past ten+ years I have watched the developments surrounding the artificial color infusion of gemstones. The work of Ted Themelis has shown that gemstones of all types can be color infused with various materials under a variety of conditions, including far lower heat than was previously imagined as demonstrated by the Tibet andesine fiasco. During this time we have noticed certain indicators in gemstones treated with a color infusion process, such as the strange color zoning as seen in the tourmaline at left. This image from 2008 demonstrates color zoning that does not follow any particular pattern of crystal growth, but rather follows the pattern of surface reaching fissures and tubes. It is by finding the failed efforts to treat these gemstones that we were able to get photographic evidence of the effort, then use advanced testing to prove the issue. This blue faceted tourmaline at left, sold as a “Paraiba-Like Tourmaline) offers a color that is based on a blue color material infused down tubes that has permeated into the gemstone. In the image at left, it is easy to see the colorless tubes that resulted from the blockage of the coloring material down those tubes. I reported on this in 2010 with other blue tourmaline that also showed color zoning based on blocked growth tubes rather than true crystal color. Sold to me as natural watermelon tourmaline, the banner item and at left, shows the same blocked tube color pattern as the blue specimen above, only this time in pink. Below is another look at this specimen in a larger images, showing that the coloring is a result of infusion down the growth tubes rather than natural tourmaline color. Images are taken through our Meiji Techno GEMT-2 microscope using San Antonio city tap water and a plastic Dixie® cup cut into an immersion cell. The tourmaline slice specimen below also provides graphic evidence that the color is due to some type of artificial infusion rather than natural color by this 90x image below that shows the growth tubes filled with the coloring material. Based on my original findings, the IIJA commissioned the Evans Analytical Group Labs to perform LA-ICP-MS elemental testing to ascertain if trace elements in a specimen study group could be identified. The findings were profound. In 2008 I found an unusual green tourmaline specimen with an extremely enlarged growth tube that was full of a very hard red material. One end was full of normal polish compound while the other was full of this red material that was so hard that it actually took a polish during the faceting process. I first sent this specimen to EAG for LA-ICP-MS evaluation. The images are below. The results are seen in a graph provided to me by EAG. The red line is the green tourmaline, the black line is the red filler material. The findings were that this tourmaline has what one scientist termed a “highly abnormal” level of iron when matching to known tourmaline LA-ICP-MS. The red filler material was composed of iron to an extremely high level. The result was that this green tourmaline had an iron content that was almost equal to the main constituent element of silicon. Normally aluminum and silicon are the “matrix” level of elements, with the other elements considered “trace” elements. But in this stone, iron was present in “matrix” levels both in the tube filler material and the tourmaline crystal itself. In order to further test this idea that iron was being used to artificially enhance the color of green tourmaline, and perhaps artificial levels of manganese was being used to improve the color of pink tourmaline, I sent the two specimens at left to EAG for analysis using LA-ICP-MS. These specimens demonstrated an unusual red or yellow fiber-glass looking crust on the surfaces that was quite unusual. The graph below demonstrates the results of LA-ICP-MS testing of these specimens as compared to the normal LA-ICP-MS tourmaline averages. Trace elements that cause color will normally increase due to natural formation, but will still be in the “trace element” range. In the case of these two specimens, the green specimen showed “matrix” level of iron while the pink tourmaline showed “matrix” levels of manganese based on the reports from EAG. The graph shows how these numbers compare. The actual LA-ICP-MS results are below. Blue is natural, untreated green tourmaline. The “Green Specimen 1” and “Pink Specimen 2” show the extremely high levels of coloring elements inside the crystals. The crystals were cut for testing the interior. Below are the actual LA-ICP-MS elemental values. Notice that the main crystal structure elements of aluminum and silicon are at “Matrix” levels. However, while they should be trace elements, the green specimen shows “matrix” levels of iron, and the pink shows “matrix” levels of manganese. These could not be present in such high levels unless artificial infusion had been done by some method. In later testing, we found the above to also hold true for much of the “Mozambique Paraiba-Like Tourmaline” that is copper bearing. The issue was widespread enough to create serious questions on the validity of any claim of copper-bearing blue tourmaline outside of the Paraiba, Brazil region. I find the Lab Manual Harmonization Committee’s use of the term “Paraiba-Like” to not only ignore the above scientific facts, but also to placate specific members of the colored gemstone industry without concern for scientific ethics or protocols. Given the overwhelming scientific evidence that presents itself in a repeatable and predictable manner, I believe that tourmalines are being artificially color enhanced by some type of color infusion process that follows the general path of the process seen in Tibet andesine. I further believe that there is a significant amount of color infused tourmaline on the market that is not being properly disclosed. These materials are being produced in China and Thailand, and getting “certified” as natural by labs in Thailand in specific, and around the world in general without concern or consideration of the above scientific evidence. The methods being used go beyond the ancient art of simply dying of minerals and goes into a level that allows for transparent gemstones to be artificially color enhanced by methods that make identification quite difficult. Clearly, just as was the case with Tibet andesine, in the IIJA lab we are only able to identify specific specimens as candidates based on the poor quality of treatment result that presents in the specimens. Specimens that are of high quality treatment are extremely difficult to identify without advanced testing such as LA-ICP-MS or XRF. There are a myriad of impacts on the market as a result of this situation. The mere use of the term “Paraiba Tourmaline” for tourmalines not from Paraiba, Brazil leaves the door open for unscrupulous dealers to take blue color-infused tourmaline and put it on the market in direct competition with the true and natural Paraiba Tourmaline, and allow corrupt profits to be obtained as a result. This does not even count the extreme toll on consumer confidence that this situation foretells. Given the impact on consumer confidence that Tibet andesine fiasco caused, the general impact of undisclosed color infusion of gemstones of all types could well cause a virtual collapse of the natural, mined gemstone industry. If color infusion can be done to feldspar and tourmalines, I have been assured that any gemstone can be color infused given the right set of conditions and the right “cooker” recipe. The best short term solution to this situation is for buyers to find established dealers who have verifiable sources direct from the gemstone mines or market centers. Buying from unknown dealers who offer large quantities of cheap gemstones with unusual colors should be a cause for concern and investigation before committing to any purchase.